Cherry blossoms, or sakura, mark the start of spring in Japan. 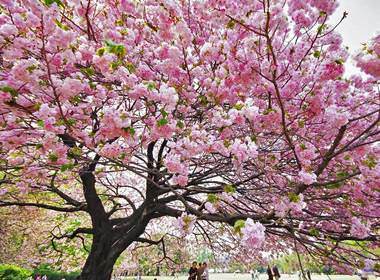 Hanami (“hana” meaning “flower” and “mi” meaning “look”) is an annual tradition where people go out to parks and gardens to watch the blooming cherry blossoms. 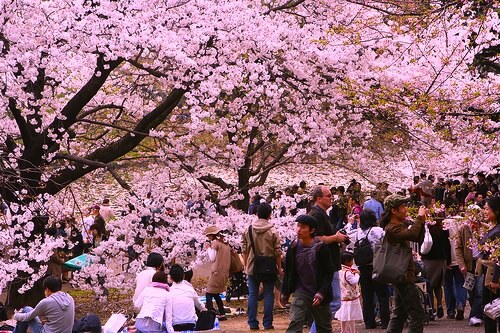 Hanami is taken seriously to the point that there are special weather forecasts that follow the progress of the blooms. The event is quite simple: you can walk around to admire all the trees any time, or you can arrive very early in the morning to reserve a spot by laying a picnic blanket. While you can label the blanket and leave until later, some parks don’t allow you to leave your spot unattended. This tradition has existed since the Nara era in 710-794 but instead of cherry blossoms, they viewed plum blossoms imported from China. Later, during the Heian era, the cherry blossoms replaced the plum blossoms. Sakura are considered sacred because 1) it marks the start of spring, which is also the rice planting season, so it becomes a time when they give offerings to the gods and pray for a good harvest; and 2) sakura are symbols of life as being fragile and fleeting, since the blossoms only bloom for about twelve days a year. While this is a beautiful event, there are also rules. For one, the trees must be treated with care. They are not to be pulled on, shaken, or climbed and the blossoms should not be picked. Even the roots must not be stepped on. Of course as with everything, don’t litter. Some parks don’t have garbage cans so in those cases, trash should be taken home. Different parks have different rules as well so it would do well to respect and know what they are.